Anyway, their latest release is Nebula, a six-tracker by Oak, which is a mysterious entity from the French city of Reims. It is an extremely productive project, this Oak, for they recorded and self-released five albums in less than three years. And FYI: Occultum Productions has recently compiled this material in a box (a wooden box with t-shirt included), so actually Nebula is not the most recent release from the label (which I stated in the first phrase of this paragraph). Beware: this one is heavily limited. It sounds oppressing and dejected, and at the same time morbid, angry and vengeful, with a melancholic touch of intrinsic hatred. It is like a tormented soul reflecting on one’s life, education, religion, philosophy and spirituality, rejection, disgust and antipathy included. Through these six lengthy compositions (in between five and eleven minutes), the author(s) / creator(s) behind Oak have painted a desolate landscape, veiled in sulphur clouds, like an ancient graveyard where lost spirits dwell, like Purgatory opening its gates to the innocent never to return. In a poetic way, I admit, this whole sonic adventure reveals so many hidden levels of the Inner Eye, and it isn’t always that beautiful, that which appears. Yet that exactly is what makes all this so attractive! The sound quality may not be that optimum. There is nothing wrong with the mix, for the interplay in between the different instruments is clearly audible. But to my (important) opinion (for what it is worth – but hey, I am the reviewer), the production could have been little more ‘full’. The strength of the electric (rhythm) guitars does not always come into its own, unfortunately, and there is some sort of noisy mist on the background. It has something à la the mighty Grieghallen, yet less convincing. But then again, this isn’t but a minor detail, for the overall sound quality is not that bad either. As said, the mix is satisfying, for the bass lines too are equally part of the whole. 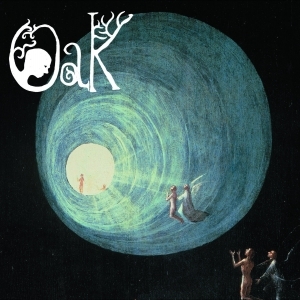 Despite a specific progressive approach, Oak do not play Progressive Black Metal. They are far away from modernism whatsoever. It is the somewhat experimental approach that gives that distinctive angle to this project’s sound.